Fashioned to fit any interior, the unique style of handle and lock system looks sleek but allows easy access. Easy to install with only 4 small screws (included), the Access Door is perfect to use for: Gas or water line valve, water meter, drain clean out, or electrical connections. Designed and Manufactured FOR and BY Plumbers, JAG Plumbing Products introduces an innovation in under-counter repair products: all new polycarbonate mending plates for kitchen and lavatory countertops. . JAG Plumbing Products strives to bring customers the best products in Canada and make them available on the best online shopping platform: Homedepot.ca - Owned and Operated in Ajax, Ontario, Canada, JAG PLUMBING prides itself on offering Home Depot Customers durable, high quality, non OEM replacement plumbing parts. 8 X 8 Inch Plastic Access Panel With Door Hinge Feature Fashioned to fit any interior, the unique style of handle and lock system looks sleek but allows easy access. Easy to install with only 4 small screws (included), the Access Door is perfect to use for: Gas or water line valve, water meter, drain clean out, or electrical connections. 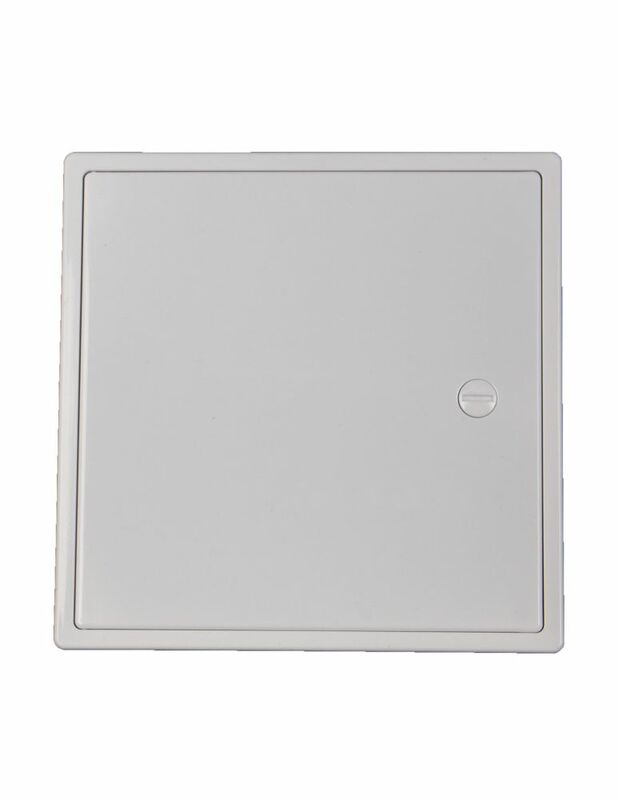 8 X 8 Inch Plastic Access Panel With Door Hinge Feature is rated 1.0 out of 5 by 1. Rated 1 out of 5 by Bryan from Poor design I bought this today to install. The supplied screws are too large and block the door from closing properly. Not very smart! The manufacturer could never have tried to install this with the supplied screws or they wold have noticed this problem. Very poor design.